At this time of year, some children are expressing worries and anxieties that often relate to the season – the anticipation of Halloween, the changing weather and darker skies that come as we get closer to winter, or even the inevitable stress that comes along with excitement as children start a new school year, connect to new people, and develop independence. This often comes up in conversations about dreams in our classroom, and recently one child needed to talk at length about his scary dreams that were “dark and floating and spooky” He told us that there were shadows everywhere and that shadows are spooky. Using the word shadow gave teachers an opportunity to offer an alternative and more positive conversation. A teacher said, “A shadow does not need to be spooky – a shadow is a place where there is no light.” This opened up conversations about the diverse experiences children have had with shadows in their environments, from outdoor shadow play to shadow puppets, and when we saw so much interest we asked children if they would like to make shadows with our classroom flashlight. Children and teachers spent the remaining time at meeting experimenting with shadows and light. 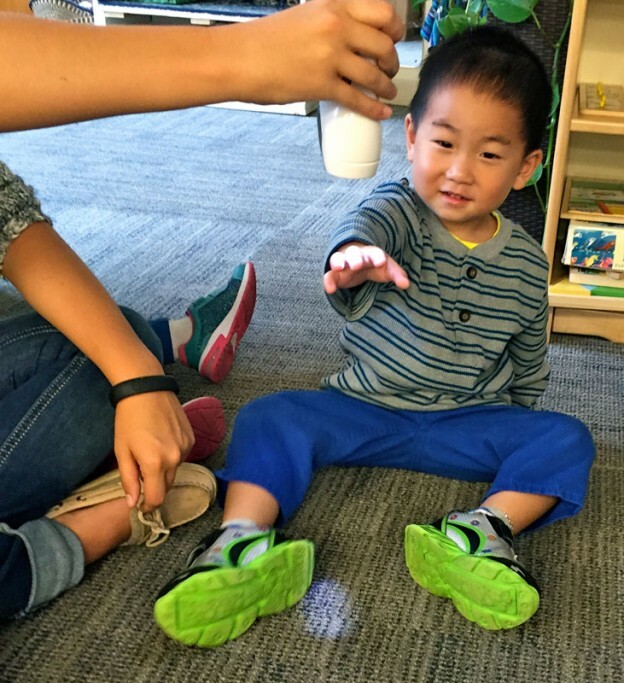 Teachers held up a flashlight as a light source so that children could find ways to use their fingers and hands to “make a place with no light” on the carpet. This will likely be just the beginning to on-going conversations and experiences together that play with light and shadow as we encourage children to verbalize their concerns and ideas. This entry was posted in Uncategorized on October 6, 2015 by Katrina Selawsky.